Learn to make Kerala Fish Curry: During my Kerala trip few months back we got to eat many new dishes and this Kerala Fish Curry was one of them. Ahh... the mere mention of Kerala reminds of of the train ride from Chennai, backwaters, houseboats, the scenic beauty of Munnar and night safari at Thekkady. We must have had liters of Sambar and rasam to our satisfaction. The homemade food during out homestay at Munnar was awesome. Sharing you what I learnt from our experience. 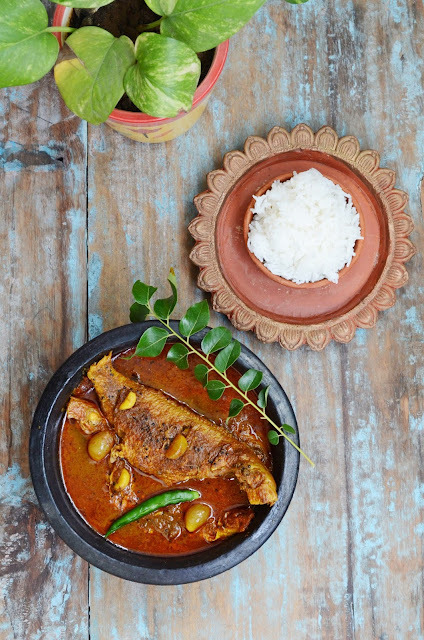 We were served this Kerala Fish Curry with appam and rice. I just made one change, the choice of fish is the only change that I have made. So, here is Fish tamarind flavoured fish cooked the Keralite way. First of all soak kokum in warm water for 10-15 minutes. ** Combine together dhaniya powder, turmeric powder, salt, red chili powder freshly grounded black pepper powder along with 3 tbsp water. Make a thick paste and add kokum into it. Keep aside. 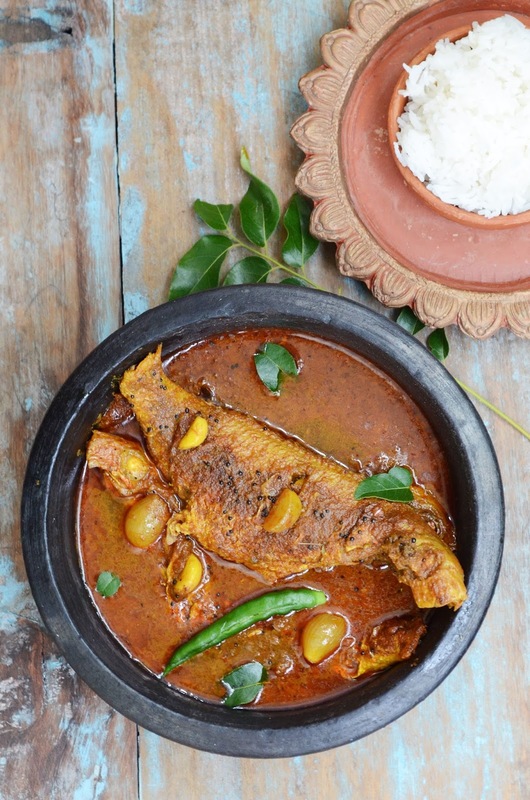 Clean and wash the fish, pat it dry with a tissue and apply some salt and turmeric powder. Leave it for 10 minutes. Heat oil in a clay pot or a flat pan. 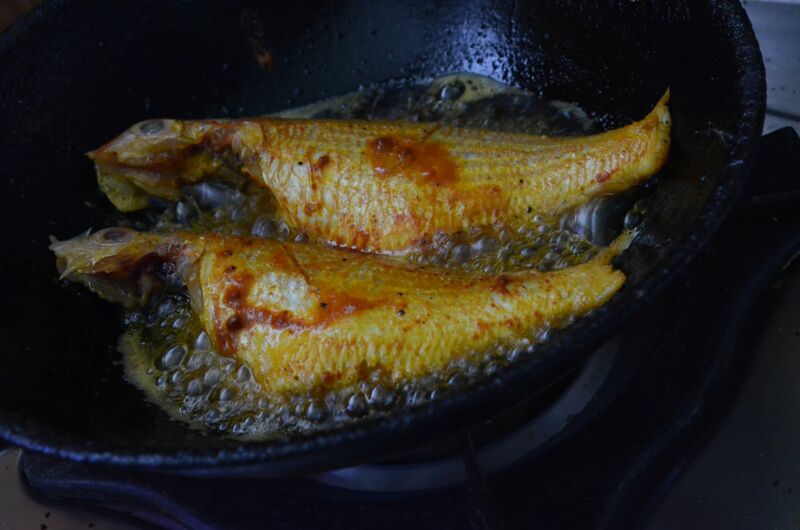 Fry fish pieces till light pink. Keep aside. In the same pan add curry leaves, mustard leaves, fenugreek seeds and let it splutter. Add shallots and green chili, when the onion starts to brown add the **masala liquid. Fry until the masala leaves the sides of the pan. Add 1 cup water and bring this to boil on medium heat. Add fish pieces in a single layer, cover and cook till done. Remove from heat and cover till you serve it (this will allow the flavours to blend in). Serve with rice. You can use your choice of fish. Once the dish is done you can add a little coconut oil for that extra oomph ! Deepa...hope u liked it....glad u tried it......very well presented. Amazing dish! i tried this recently and it made superb. My family loved it. Thanku for sharing!